This is two days after I did it (please note the healthy disrespect for shaving of the legs, and the huge missed spot on day two. You'll see the legs better shaved. So you're wondering how did I do this… Was it a bear… nope, was it a tree falling after felling… nope, was it a meteor that struck me from the heavens that would have struck down a lesser human… nope. 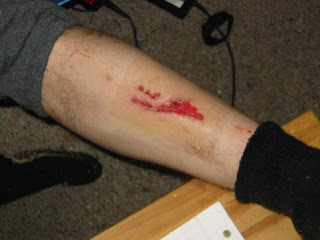 I tripped over an old tree stump while carrying a smallish 50lb deadite, joy! This was my second tree of the day too, and while it hurt like hell, I just plodded along until later that evening when I was finished up and resting, then wondered what the hell I was doing. Ah well live and learn. So you're now wondering how you can trip over a tree stump, well it's not too difficult when it's about 18-24" high, and you're plodding through smallish new growth spruce with a 8-10" dusting of snow. I kind of think that I might have made it worse for myself if I'd fallen over I'd likely be fine, but nope I had to be like a "weeble" and wobbled but didn't fall down. Thus leading me to scraping my shin down the sharp point of the stump from the broken tree. This happened on Tuesday 27th the bitter irony is that I should have been doing this on Monday, Tuesday I had planned to go up to Fairbanks for some stuff and to get the truck re-aligned after my little departure from normal control; but it snowed on Monday, Monday night and Tuesday morning and discretion is the better part of valor. Wednesday I did some more work around the place, like bucking the stuff we didn't get to on Tuesday, but I avoided going back into anything uncleared. Wednesday and Thursday were the same. Friday I ventured forth into the bush again and wouldn't you know it, a freakin' willow about 1/4" diameter and about 20" long jabbed me right in the middle of that gouge, but anyway we got enough firewood for the next couple of days; which was good since when I checked out my leg I had a swelling just below the tape on my dressing, so Saturday (Halloween) I rested up [Plickety says "And I rested up as well, other than bucking the last bit of yesterday's collection, because I managed to drop a log on my foot during the middle of the night fire-feeding and busted the knuckle of my big toe again."]. I think the bruising is the worst part now, which is taking a little while to come down. To my credit barring aches, pains, muscle strains, and some bashed fingers and toes this is the first major injury I've had here. Anyway must get on. Hi, Plickety, it's Cloudfire . 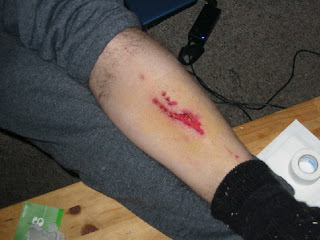 . . Just dropped in to catch up on your blog, and saw your gash, right off . . . Well, you know that a nurse just can't keep her nose out of these things, lol. Seriously, I wanted to share a home remedy with you that I recently discovered, and have had good luck with. It's for wounds that are starting to get infected. It goes like this: After cleaning the wound, apply unfiltered raw honey, then a layer of mullein leaf, then wrap or bandage the wound. Our experience with this is that after a single day of treatment, the tenderness, redness, and suppuration is gone. I thought that this might come in handy, up there. Looks like your having fun up North. Just found you blog a few weeks ago.